A recent review I wrote for Whitehot Magazine. Galeria Pelaires is one of the oldest, if not they oldest gallery in Palma, with a storied past that includes Joan Miro, Picasso, and other legendary artists throughout the 20th century. Visually sublime and meticulously crafted, the work on view by Idris Khan seems to vibrate as you move closer into its space. What first appears to be floating, brushy, cloud-like abstractions, soon reveals itself to be layers upon layers of letters, words, and phrases that have been carefully stamped onto the surface, and which jet outwards from a dense inner core. In this series of work, Khan begins with an aluminum panel and builds up the surface with layers of gesso paint made up of marble dust, slate dust and rabbit skin glue, giving the canvas a dense “stone quality,” as he says, onto which the stamped lettering seems to absorb into the surface. The words are in fact Khan’s own, his thoughts and responses about certain philosophical, art historical and theological texts, and though it’s tempting to approach them to try and make out their meaning, the closer we look, the more frenetic and dizzying the words become, leaving us at a distance, in a kind of perpetual blur. The scratchy, peeled back surfaces of Gregor Hildebrandt’s paintings presented here are made by using cut up pieces of cassette tapes and cassette boxes which are then partly painted over with acrylic paint. Musical symbols and references lie within the repeated vertical lines, like the static fuzz on a radio seeking to get the signal, we can make out subtle images, but they are muted, or perhaps coded in their gesture. In the painting, Das Spiel moege beginnen, (The game can begin), 2017, the layering of tape and paint calls to mind an echography, as if we are trying to focus in on the white symbol floating within a dark void to gather its meaning or purpose. We sense the tension, the movement, the cryptic layers within the paintings on view in this exhibition, which seek to question the the relationship between viewer, artist, and image. It’s as if they and we are approaching a line between a moment of calm and the impending storm; the hush on the verge of releasing a loud scream. “Dissolution of Distance” is on view through September 14, 2017. I recently wrote this article for Trend Tablet. I fell hard for the dyed vintage textiles of Palma based Espanyolet and it was such a pleasure to be able to meet them in person when I arrived in Mallorca. 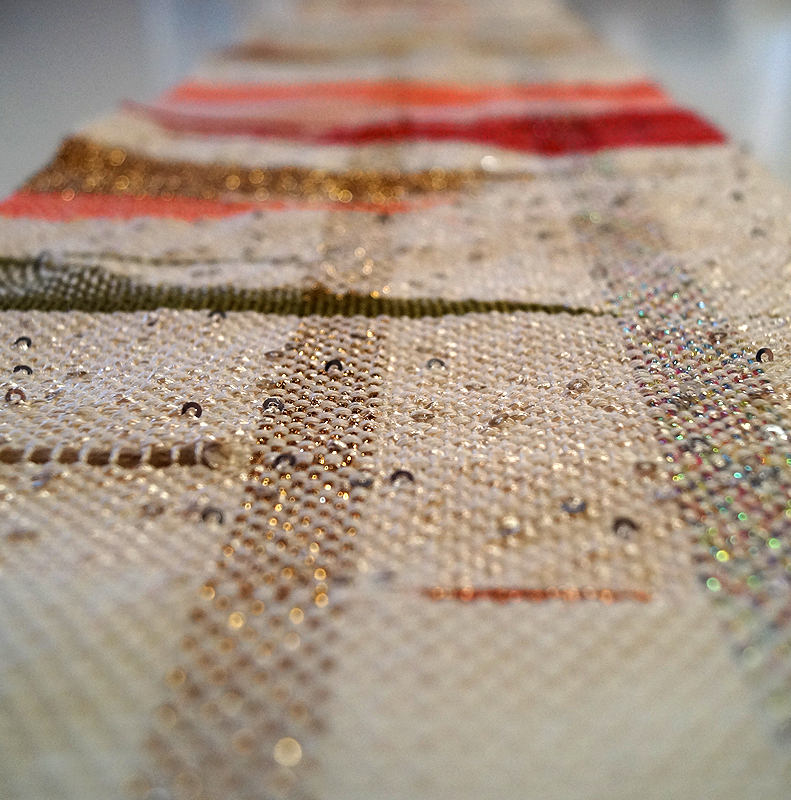 The subtleties of color and texture are incredible and their collaboration inspiring. For the range of bed covers, pillows, and blankets, espanoylet sources only quality vintage linen fabrics from across Europe, such as Spain, France, and Romania, each of which has its own weight, weave pattern, texture, and natural color, so the dyes and process are adapted to fit each style. For example, Melissa says, “the vintage French linen is very fine and with an “optic white” color so it lends itself to our lighter, finer & more delicate colors like almond blossom pink. On the other hand, some of the vintage Spanish linens are highly textured, rustic, and irregular so we can play a bit more with stronger color.” Once the hue is determined, the dye is mixed with algae giving it a gel-like effect that allows them to paint directly onto the fabric with brushes rather then dipping, creating their signature painterly style that offers more interesting gradations, tones, and textures. One favorite color palette of the designers is Marsala. Originally they were looking to capture that vibrant pink of bougainvillea which surrounds not only their studio, but much of Mallorca. 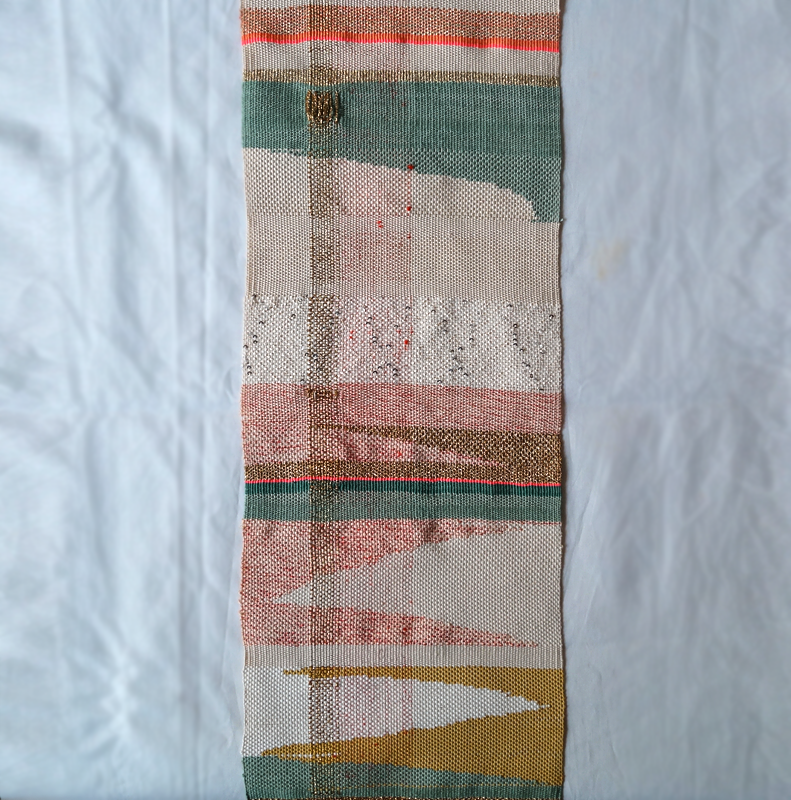 What happened was that during the curing process which is done outside, the sun faded the color, creating a more eroded, muted effect that they ended up loving even more because it worked better with the fabrics. From here they began adding other colors to the batch like chocolate brown, grey or yellow, creating a range of pinks from a deep coral pink to light peach, and which has become one of their most popular colors. Vessel. It’s a suggestive word with several meanings and some ambiguous associations. It’s a physical word, kind of weighty when spoken. The word Vessel, in the context of art + design, suggests antiquities much as contemporary objects. I like the word for this reason, and because it lends a sort of freedom to its definition around these objects. A vessel might be functional or not. It might be a unique piece or made in small production. It might stand proudly on your mantle or be perched outside in the garden. It might be smooth and soft or chunky and rough around the edges. Swirls, chunks, geometry, structure, Mother Nature, lunar landscapes, clay... Each of these artists is working (or have worked) in very different environments, with different motivations and inspirations. Included in this first online presentation, a new project from The Vitrine, are: Hilda Hellström (Swedish, lives London), Rimma Tchilingarian (German), Tracy Wilkinson (English, lives in Los Angeles), Peter Voulkos (American 1924-2002), Shoko Michikawa (Japan), & Ben Medansky (American). Hilda Hellström is a Swedish artist who lives and works in London. She studied Product Design at Beckmans College of Design in Stockholm, and went on to get her Masters in Design Products from the Royal College of Art in 2012. 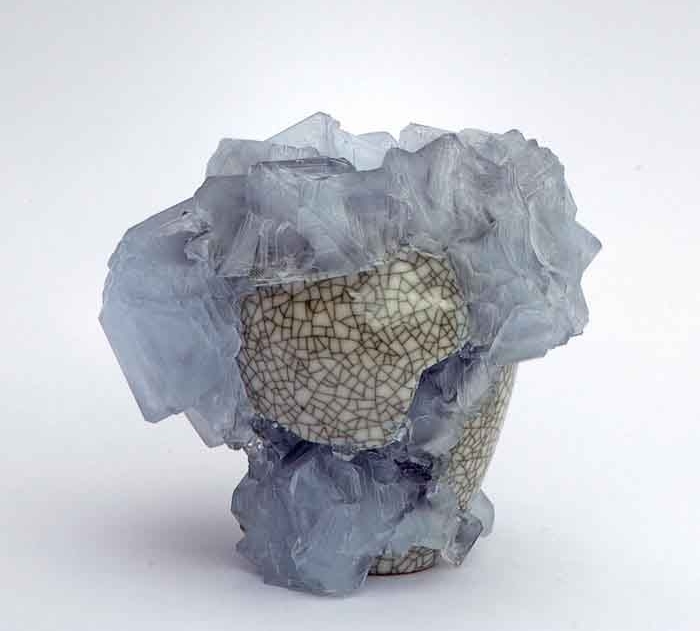 That same year she began her series of Sedimentation vessels and urns using Jesmonite, a non-toxic, acrylic-based plaster. Inspired by many things including rock sedimentation and geological phenomena, the patterns on these sculptural vessels are startling and impossible to define. Tracy Wilkinson is a ceramic artist and basket weaver who lives in Los Angeles. She recently began a series of sculptural ceramic pieces that combine elements of basket weaving using natural fibers. The objects feel as though they are in flight, light and airy, with the contrast of the earth-toned glazing that keeps them grounded. Inspired by the Southern California landscape, sailing, and Native American basket weaving, the results are unique, very abstract forms that capture a sense of movement and rhythm. The Gradient Vase by Berlin based artist, Rimma Tchilingarian. Rimma studied Industrial and CommunicationsDesign at the University of Applied Sciences at Potsdam. She is interested in experimenting with the unique qualities of porcelain and exploring new possibilities in the medium. Her work is a balance between traditional craftsmanship + contemporary design. Shozo Michikawa was born on the island of Hokkaido in Japan, in 1953. He now lives in Seto, Aichi Prefecture, a center for ceramic production since ancient times. His work is very inspired by the landscape in which he lives and works, including Mt. Usu volcanic near where he grew up. He says, "the energy of Nature is truly immense. No matter how much our sciences and civilization might evolve and multiply the power of human beings, it is inconsequential in the face of Nature"s typhoons, earthquakes, tsunamis and erupting volcanos." (Source: Puls Ceramics). Ben Medansky. Vessel, Kepler Series. Born in Arizona, Ben Medansky now lives and works in Los Angeles. He studied at the Art Institute of Chicago and worked with several artists including Peter Shire, Kelly Lamb, and the Haas Brothers before going out on his own and starting Ben Medansky Ceramics in 2012. As he says on his website, "his ceramic practice is simple: a few pounds of clay, an extruder, a wheel, basic tools, trusted apprentice, experiments in glaze and a vision for each individual objects." His work includes one of a kind objects, vessels, and functional objects, each made by hand. There is a strong influence of geometry and architecture in the forms, and the southern california and desert landscapes in the glazes. Ben Medansky, Laika//VesselBuff stoneware clay body. Matte Black/White Glaze. Extruded Attached Fins. One of a kind. 6" x 9". I love this cross between vintage and contemporary in his work. And such unusual forms. This is our second online presentation in our ongoing series about specific materials, form, function, color and so forth, explores the dynamic of warp and weft when applied to the humble chair, often transforming it into something sculptural and simply not quite functional. The crossing and pull of threads, whether silk, rope, cotton, polyester or natural linen adds another dimension to these chairs; a pop of color, a sense of transparency or fragility, reflections about the environment and material, shadow and light. The Alvi Silk Chair by Swedish designer Asa Karner of Alvi Design. Karner is interested in creating an environmentally friendly range of furniture by incorporating colorful silk threads crossed with the oak frame. It’s a beautiful balance between transparency and mass. Light and shadow add another dimension to this piece as well. Tanya Aguiña is a Los Angeles based artist + designer. Her Teotitlan Chairs (1 & 2) were inspired by Oaxacan weaving traditions she discovered in the town of Teotitlan in Mexico. I love the black + white contrast, and the ghost-like impression of the white threads against the black frame. Wanting to include some vintage pieces in the group, I came across this fantastic chair in a google search on vintage chairs that incorporated hand weaving techniques. It has the weighty feel of a loom and almost looks like some sort of weaving device. I had to include it. I’d love to know who the designer was…. Anton Alvarez is a Swedish-Chilean designer who currently lives in Stockholm. The obsessive wrapping technique that Alvarez created for his thesis project at the Royal College of Arts creates and builds furniture and objects through binding the components with hundreds of meters of threads and glue. This short video shows the process and is worth a visit. Photo by Paul Plews and courtesy of Anton Alvarez. Israeli designer, Rami Tareef started COD, or Craft Oriented Design, as a way to explore the relationship between craft + design and between the handmade and mass-produced. Tareef wanted to see how the two fields might work together, to test the limits and engage new possibilities. I had a hard time finding information about Allan Gould (1908-1988), but he was also a painter and did several murals under the New Deal Act as well as being an interior designer and furniture maker. He lived and worked in New York. This chair was produced in natural rope as well. Beverly Pepper is an American sculptor whose whose career spans decades. Born in 1922, she has worked in cast iron, bronze, steel, stainless steel and stone. Her sculptures are generally massive and meant for the outdoors but I was drawn by these beautiful, stainless steel tabletop works. She has an incredible ability to capture movement and form in her work. 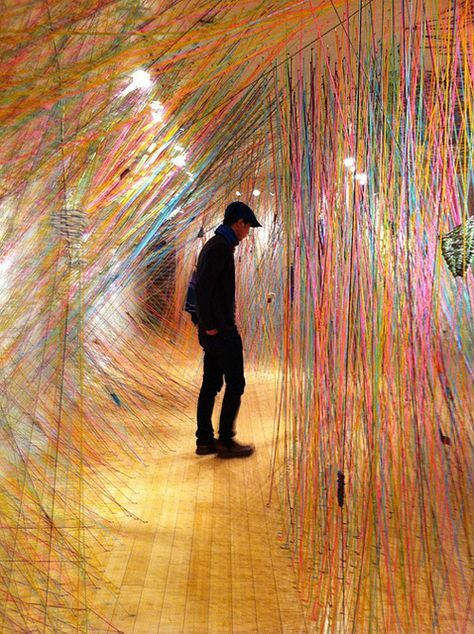 She is also known for site specific projects in many cities around the globe. These projects generally integrate with the landscape around them, creating functional public spaces that make you linger. Stainless Steel. 14 x 8 x 16 inches. Maybe it's because I need some structure right now in my own life that I turn to The Grid to start the first post in the new year. (previously posted in January 2015). Somehow the idea of formal, structural work that is built up from line, shape, and color is connecting with me in the first phase of 2015. Order yet with rebellious undertones. The work created by these four artists, Anni Albers, Agnes Martin, Richard Anuszkiewicz, and Sol Lewitt are regular sources of inspiration. Textile designer, weaver, writer and printmaker, Anni Albers (1899-1994) inspired a reconsideration of fabrics as an art form, both in their functional roles and as wallhangings. (albersfoundation). Her formative influence on so many artists was comparable to her husband Josef but often less considered. In weaving, prints + jewelry her work remains a force. Rug Design for a children's room, 1928. Gouache on Paper. All images courtesy of the Albers Foundation, an outstanding source of information. 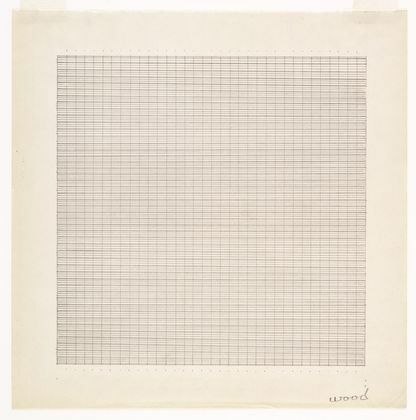 Agnes Martin (1912-2004) is one of the first people that comes to mind when I think of the grid. Soulful, subtle, powerful, Martin's work is often referred to as floating, or transcendent for a reason. Her ability to transform lines, grids and fields of color into something wholly other is inspiring as well as are her writings about art and the influence of Eastern philosophies on her work and life. She was raised in Vancouver, lived in NYC for a time but spent most of her life in New Mexico after 1967. Richard Anuszkiewicz, b. 1930, should be more of a household name. Having studied at the Cleveland Institute of Art (1948-53) and then with Josef Albers at Yale University School of Art from 1953-55, he is one of the leading artists of the Op-Art movement from the 1960s-1970s, his work constantly and continuously challenging formal, structural and color effects. He has had a long, strong, and experimental career that deserves a retrospective soon! Sol Lewitt (1928-2007) was a pioneer in the movements of conceptualism and minimalism. His work, both graphic and multidimensional, crossed into printmaking, drawing, painting, sculpture (or structures, as he preferred), and enormous wall drawings and installation. Using line, color and shape, he produced a vast body of work and his his precise calculations and meticulous working process is legendary. 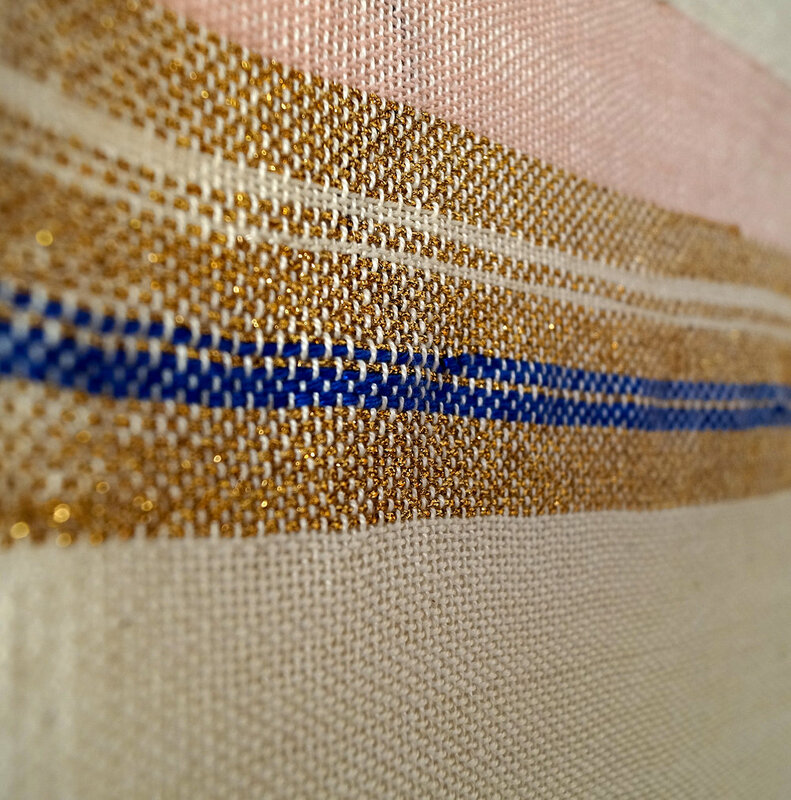 When threads are used to carve out space, it can be transformative. Soft, yet structural, defined lines with fluid movement, graceful, colorful, free form. These are four artists who maximize(d) the power of the humble, beautiful thread in innovative gestures. Fred Sandback (1943-2003), Elsi Giauque (1900-1989), Anne Wilson, & Tanya Aguiniga. Elsi Giauque: I've not been able to find out too much information about this most intriguing artist. but when I saw her work in person and later in books, I was blown away but her innovative use of threads as sculpture, architecture, object. Wish there was more work out there! Elsi Giauque, Installation view, Decorum: Musee d'art moderne, Paris. Fred Sandback was born in 1943 in Bronxville, New York. After receiving a B. A in philosophy at Yale University, he studied sculpture at Yale School of Art and Architecture. In 1981 the Dia Art Foundation initiated and maintained a museum of Sandback's work, the Fred Sandback Museum in Winchendon, Massachusetts, which was open until 1996. Fred Sandback Portrait and biography courtesy of the Fred Sandback Archive. Tanya Aguiniga & Mash-up Contemporary Dance Performance/collaboration from June 2014. Image courtesy of the The Radder. Tanya Aguiniga Installation at the California Craft + Folk Art Museum, LA, 2011. What is it about these works that makes them so magical? Each of these designers/artists seem to move between organic forms, materials and manipulated process. Art and nature battling it out in experimental, independent objects. In all occasions the artists also seem to be having fun with what they are doing. They are taking risks and pushing boundaries in long established mediums. Glaze coated so thick it is meant to explode in the kiln (Kurwata); turning a useless, broken ceramic object into a crystalline exotic hybrid species, (Wegwerth), fractals, fossils, and nature in exquisite glass objects (Kramer), and experimental glass constructions that are as informed by nature as by brutalist architecture. (Wolfe). Laura Kramer Memento Specimen III 2015. Photo courtesy Heller Gallery. People, places, and things that captivate and keep the inspiration alive.